The NDF has a new head – or rather heads. 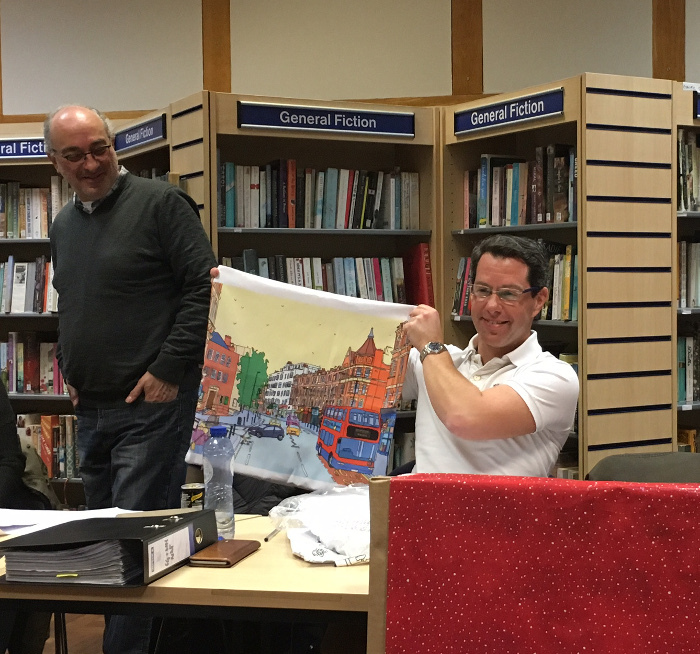 After five years of steering the Neighbourhood Development Forum, chairman James Earl stepped down at last night’s AGM. A memory of West Hampstead to take away! James is leaving West Hampstead for pastures new. His replacement(s): NDF treasurer Nick Jackson and former Lib Dem local councillor Keith Moffitt. In the end, the whole handover process was remarkably smooth. 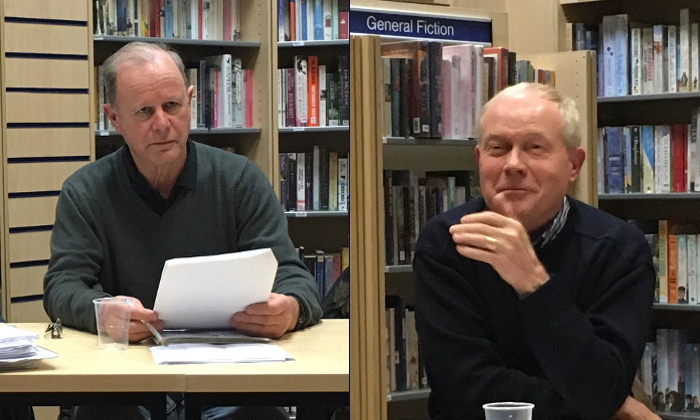 When James asked for nominations, Lib Dem cllr Flick Rea nominated Nick Jackson, Nick nominated Keith Moffitt and at this point Keith confessed that they has discussed it in advance and had agreed to share the role. The rest of the committee agreed to stand again, with Nick retaining his treasurer role. All rather uncontroversial. Nick has been a core member of the NDF ever since it was established, and Keith knows his way round the corridors of Camden better than anyone as former leader of the council. In James’ final report as chair he said that in the five years since the NDF was set up it has reached 500 members, written an Neighbourhood Development Plan that will last until 2031! and is making traction with its priorities. 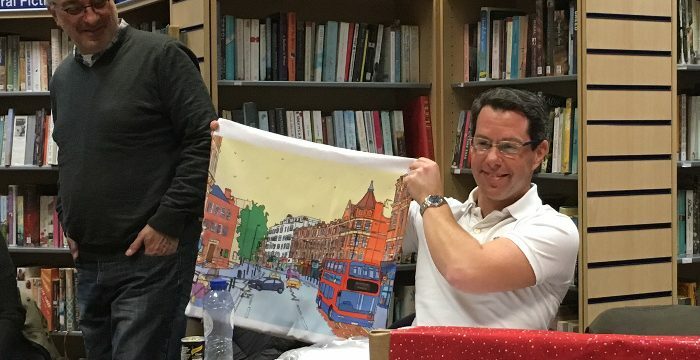 In his new role as co-chair Keith thanked James for the huge amount of work he has done for West Hampstead and Nick presented him with a couple of memories of the area. Ever since the Neighbourhood Development Plan was approved by referendum, the role of the NDF has been a little hazy. Is it there to ensure the plan is adhered to? Should it take a more proactive role in continuing to shape the development of the area? How should membership be defined? These are all questions that Keith and Nick will need to answer in the coming months. Nick’s first thoughts were that “the role of the NDF now is to ensure that the Neighbourhood Plan is applied and enforced on all significant schemes in the Fortune Green and West Hampstead wards. We are also looking at the future of the designated Growth Area around the stations and we need to continue to press for master-planning for all the significant potential sites in the Growth Area to avoid uncoordinated development, and to maximise the value to the community of any development there”. He added, “The immediate big challenge is to maintain the high standard of evaluation and comment on proposed schemes in the area, a process which has been very effectively led by James over the past five years, and that has won some substantial improvements to the proposals. There are likely to be several big developments coming forward soon that will need close scrutiny and robust comment. For instance, the developers of the very large and dense scheme for upmarket retirement housing on the Gondar Gardens reservoir green space say an application will be submitted this year. We will be supporting the local community in seeking a satisfactory outcome”.